Motorola's Android release-a-thon is showing no signs of slowing at the moment, with one of the latest devices packing some pretty serious multimedia tech. The Motorola Motoroi has only been released in Korea, but word is it's making its way to other shores, with Europe hotly tipped to be one of them. The Motoroi is running Android 2.0 at the moment, meaning its pushing the boundaries of the Android tech out there at the moment. The 3.7-inch screen is pretty sensitive, picking up the lightest of touches. Sadly we couldn't get the internet to work properly on this phone, but it doesn't seem to want to resize text for you when we tried zooming in on the error page. As you can imagine, there's a headphone socket for your own cans - but there's also an HDMI-out port so you can show your friends what you've been recording on the big screen in HD. In fact we don't think we've seen a phone with as many ports as this - it's a good thing they've all got covers, though you might want to grow your nails a bit if you want this phone. The camera is pretty nifty on the Motoroi, although we weren't able to take any HD footage for some reason. However, it was quick and responsive and focused well on the items in shot. 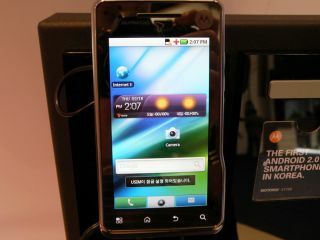 Video also looked stunning on the WVGA hi res screen - but we've seen so many mobiles like that at MWC it's getting a little bit boring now. There's sadly no UK release date for the multimedia behemoth yet, but we'll keep our ears to the ground and let you know if we hear anything.